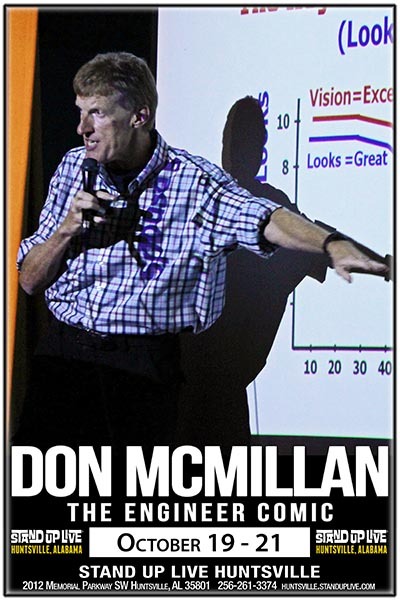 Don McMillan graduated from Stanford University with a Master's Degree in Electrical Engineering. He then went to work at AT&T Bell Labs where he was part of the team that designed the world’s first 32-bit microprocessor. He then moved to Silicon Valley where he helped launch the start-up company, VLSI Technology. At VLSI, he designed over 20 integrated circuit chips was awarded 3 patents. So far he sounds like a really funny guy, doesn't he? Then in 1993, Don quit his job to become a stand-up comedian. That year he won $100,000 as the Comedy Grand Champion on "Star Search". Don's been seen on "The Tonight Show", "HBO", and the "Comedy Central". These days, Don spends most of his time writing and performing customized corporate comedy shows for companies like Google, Apple, IBM, Ford Motors, Exxon/Mobil and NASA. Don has performed more than 800 corporate shows in the last 20 years and he was named the #1 Corporate Comedian by the CBS Business Network. Currently, you can check out his big internet hit “Life After Death by PowerPoint” at his website “technicallyfunny.com”.